If you are a beginning gardener you might be looking for the must-have, essential gardening tools that more experienced gardeners can’t live without. Most gardeners like to keep particular tools within reach when they go into their gardens. Although the cannot-live-without tools vary from person to person, there are some basic ones which everyone will want to have. As a beginner, there are a few essential garden tools you will want to pick up to make sure you have them readily available for you. I’ve included a gardening tools list with pictures and their uses. As a beginning gardener, sometimes you don’t know what a specific tool is used for or what the name of it is, so this should help you out.. Gardening gloves are a must. For everyday gardening, the best gardening gloves I have found so far are the nitrile gloves. These gloves have a plastic coating on the bottom of your hands and the top of your hands would have cotton. These gloves are very flexible, thin enough that you can feel a lot more than other gloves, but the nitrile provides a bit more of a barrier than the cotton would. Plus the cotton on top makes these gloves breathable. A garden trowel is invaluable when gardening. It is small enough that you have great control over it. Garden trowels are also very versatile. You can use it when pulling weeds to dig down and get the roots out as you are pulling out the weed. A trowel is also great when transplanting plants. You’ll use it to dig a hole slightly larger than the mess of roots and dirt of the plant you are transplanting. The best garden trowel is going to be one that is strong. Not only strong enough to hold the dirt from the hole, but if you are using it for weeding, some of the weed roots are strong! This is yet another garden tool that most of the gardeners swear by and list it as a must-have. A sturdy yet comfortable pair of sharp pruners is worth it’s weight in gold. Some other names for pruners are pruning shears or loppers. These look like large scissors and come in different sizes. Most likely the best pruning shears for you will be the smaller ones. Not super small by any means, but ones for basic gardening tasks. In my garden and yard my favorite and best pruning shears are used for all sorts of things. To cut back blackberry vines or prune rose bushes. I also like using my loppers for cutting pumpkins off the vine in the fall. We have a few different pairs of pruning shears. We use our large pruning shears for cutting back branches on trees or for really thick branches on bushes. If you get a high quality one, if you take well care of it, it should last a lifetime. A regular spade (rounded blade) shovel is another item on the must list of gardening tools. There are many different uses for this shovel, from digging holes for larger plants that have a root ball such as a bush or tree or you might need to use the shovel to move dirt from a dirt pile to move into your garden. Shovels have come a long way and have really changed over time, ergonomically. Having a D-shaped handle on the shovel, helps to give you better control when you are digging and tossing heavy amount of soil. Using a welded steel one is a better choice than using one made from wood because the steel is more durable and will not even flex under heavy loads. Having a wide step plate which is wide is good to have to help relieve pressure from your foot when you step your foot on it repeatedly. A hoe is another great gardening tool to keep around. Weeding isn’t a fun job. If you have rows of plants and you need to get some weeding done quickly, the hoe will be the tool you want to use. A wheelbarrow gets tons of use in a garden. There are plenty to choose from with galvanized and hard plastic as two of the main options. Many of my friends swear by using a cart in place of a wheelbarrow. They say the cart can do as much as the wheelbarrow can, but that it is easier to pull around. When trying to decide which to get, if your yard has narrow sections that you might need to push the wheelbarrow/cart through, the cart might not be able to fit through it, while the wheelbarrow has no problem. You will want one that is strong and sturdy, yet lightweight enough to easily transport it when it is full. If you need to use your wheelbarrow to transport water, you can add on a waterbag so it won’t be spilled. I prefer wheelbarrows to have a single wheel, but probably it’s just because I grew up using these types of wheelbarrows and I like the ability to turn quickly and easily. Having two wheels on the wheelbarrow makes it so the wheelbarrow is sturdier and harder to tip over. If you don’t have a lot of strength and think you will be using it for heavy loads, you might prefer to have two wheels. You will want a hose and some way to hold the hose. You will be using the hose to water all of your plants. If you plan to use a watering can, you might find that using that is more work than you originally thought. Another thing with the hose is that you might want to also have either soaker hoses or a sprinkler depending on how you have your garden setup and how large it is. A hose nozzle is something that is great to have. It is used to adjust the water coming out of the hose in different spray patterns and settings. For many people, basic and simple household scissors are a must-have as their gardening tool. It can simply be kept in the pocket and used for deadheading the flowers, snipping herbs, harvesting vegetables such as peppers or opening up a pack of seeds or potting soil or even to simply cut a string. Many gardeners always keep scissors close to them when gardening. Saws are useful for cutting quickly and cleanly through fairly large plants. It is also useful for cutting down small weedy trees. Many gardeners prefer to use the bow saw for the purpose of pruning and shaping of the trees, or for clearing out the undergrowth. Others like to use a folding saw because it is portable. Similar to the shovels, not just any type of rake will do. There are many types of rakes and they all serve different purposes. There is a shrub rake, which fits into small and tight spaces better than a big fan rake. The big fan rake is better for raking off the mulch, leaves and also for tidying up when you are collecting the last garden debris. The hard bow rake can be used for moving the mulch and leaves and you can flip it over and use it for moving the soil and the compost. It is also used for fine tuning the annual beds and for smoothening of the soil. The hard rake is also useful for using after putting soil in a planting hole and smoothening the soil to blend it with the rest of the bed. This list of gardening tools mentioned above is not an exhaustive list of the must-have tools. 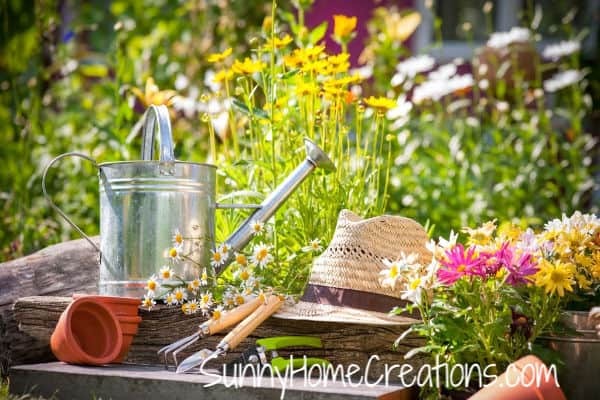 There are many more tools which are also very important but as mentioned, the need and the requirements would actually dictate what should be the ‘must have’ for your garden. So, while it can add up quickly to buy gardening tools, having them will make gardening so much more enjoyable. You can almost always find used garden tools on Craigslist or Facebook marketplace. The other place is many times some of the big box stores have really good sales, so keep your eyes out. Especially as the season winds down and they are trying to clear out their inventory.